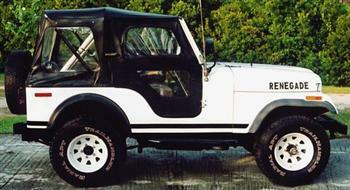 The Jeep CJ5: 28 years best of breed! The Jeep CJ5: From Workhorse to Thoroughbred! The little Jeep CJ5 emerged from the proven ruggedness of the earlier Military Jeeps of World War II through the post-Korean War era. In 1955 Willys-Overland had already been bought out by Kaiser Industries (1953) although Kaiser continued to call the Universal vehicles "Willys" with the dealerships known as Kaiser-Willys...the CJ5 was born. Note: The Willys CJ3B managed with the flat front fendered old military design from 1953 through 1964 and was produced for a period with the CJ5's as well. 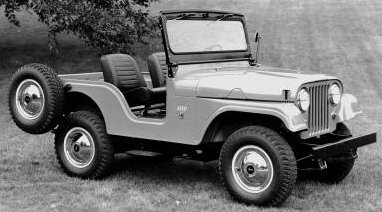 Jeep manufacturers have always looked for the most profitable markets for all of their models, especially the post-war civilian or CJ styles. Not particularly suited as a family ride or street commuter the CJ5 niche was carved mostly for farming, ranching, mining and other rugged outdoor work environments. These tough little 4x4's were invaluable in extreme climates and road conditions for getting to and from work sites or simply getting to work at all. 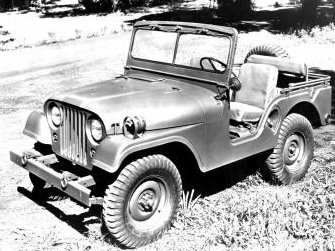 Thanks to the Military heritage and their literal "trial by (or under) fire", this Universal Jeep had the workhorse pedigree. 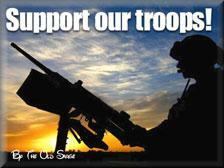 But could it become a thoroughbred in the civilian marketplace? Well, we know the answer to that question as the Jeep CJ5 became the benchmark for greatness in functionality and utility throughout its 29 model year run from 1955 through 1983. Many of the CJ5 critics will justifiably refer to the inherent safety limitations of the little 81 inch (and later 83.5 inch) wheelbase, which coupled with the high ground clearance (translated as high center of gravity) is a recipe for instability and potential rollover disaster. However, at least the initial intent of the CJ5 design was for utility in tight inhospitable conditions such as narrow trails with undercarriage busting rocks and unstable surfaces. And few other vehicles can accomplish these tasks with such ease when in the hands of an experienced pilot. 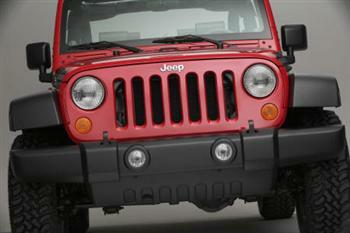 See more on the Jeep CJ5 and Jeep safety. Jeep enthusiasts and serious off-roaders are often highly attracted to the Jeep CJ5 for its off-road versatility and no-nonsense go anywhere capabilities. There is definitely still a loyal following for CJ5 owners, users and re-builders. I personally have never owned a CJ5 although I have driven several, but I once owned a mildly modified 1953 M38A1, which you may recall is the CJ5's early military predecessor. This old Jeep could climb a tree! Well...maybe with its big aircraft winch on the front and the transplanted Buick Dauntless V6 engine it could. Seriously, this vehicle was awful on the street, but was absolutely incredible off-road! That M38A1 did however give me a taste of the CJ5 in its early beginnings...and I for one was quite impressed with its off road abilities. Also...join and watch my JeepBlog page...and free Jeep Experience Newsletter for new info and updates. 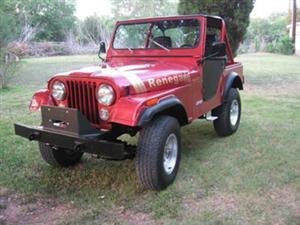 Walter from Texas sent this beautifully restored 1979 CJ5 Renegade...Click on the photo to learn more! 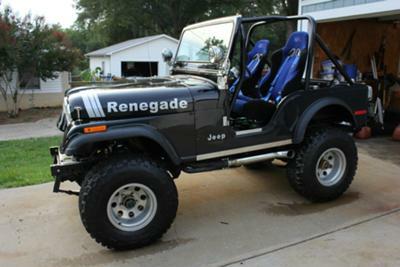 The CJ5 Jeep was given a hot V8 option beginning in 1970 called the Renegade package...click here! !